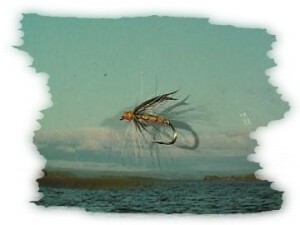 This fly was invented in May 1854, the place: Sprouston, Roxburghshire. Canon Greenwell, the fly-tier James Wright and schoolmaster Brown co-operated to produce the first Greenwell's. No matter whether it is tied as dry or wet-fly, the three men invented a great catcher. Originally thought to imitate a particular olive Ephemerella, it represents practically the entire range of this species and catches fish throughout the season. In the acid mountain lakes of the North-West it is particularly useful when, on calm days with easterly winds, fish are rising but not taking very positively. The Greenwell's evolves then into a last resort-fly and often saves the day. Hook sizes can vary from 12 to 14 or 16. Watching the anglers at Eany, Owenea or any other river and having a talk with them is always very interesting. But it confused me quite a bit when I first began salmon fishing: one caught them on a Mallard and Claret size 12, another on a size 6 General Practitioner. Fly patterns and sizes were so different, it was impossible for a beginner to find a, so much wanted and needed, rule or guideline. After a while it became clear to me, that the fly is not the only decisive factor here: the secret is to know the water you are fishing and to believe in your flies. How else is it possible, that salmon are caught at the same day, on the same stretch of water, on such a wide variety of lures, like tiny flies, big spinners, even worms? Water levels? Time of day? Colour? Weather? Persistence is the great thing in Salmon angling. Have suitable flies and trust them. Get to know the river and never give up, no matter how hopeless it seems sometimes. Then comes that moment, as if by itself, you haven't done anything different, but you catch the first salmon in that particular river or even stretch of river. With that a knowledge about the river begins, self-confidence sets in, you cast with a different attitude, feel the water via the line differently, you are fishing now, suddenly only casting and presenting exists, everything merges into one another, you cast ten or fifteen times at one spot, wake up as if from a trance when you wind in to walk on, realising there was neither future nor past, just now, a total present. Nothing else but a form of meditation, the circle of concentration is closed, everything is the one. That's why I have to fish.